LED Light Therapy is a new kind of skin care treatment that’s relaxing, painless, and most importantly, non-invasive. It is often used to stimulate collagen and help treat mild to moderate cases of acne. To do this, the treatment makes use of a set of light-emitting devices to emit low-level light energy that can enter the deep layers of the skin. 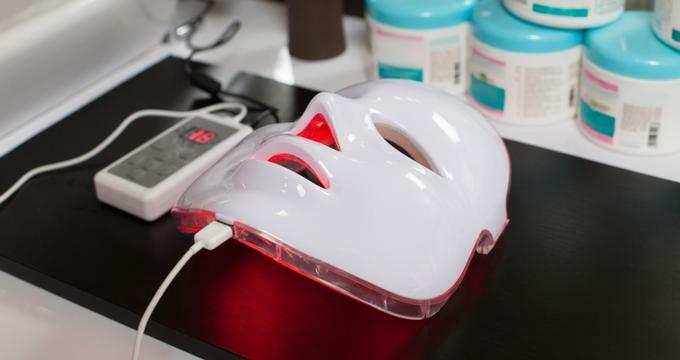 By using this Red light LED technology, people are able to encourage cellular activity within your skin so that it produces collagen and makes your skin look plumper. As a result, fine lines, stretch marks, and wrinkles are effectively reduced. Skin that’s been damaged by the sun starts to heal as well, all without having to experience the redness that your skin normally gets when subjected to IPL and other laser treatments. Clearly, this kind of technology is yet to compete with the effects of actual plastic surgery, but its advantage is found in the fact that it’s more natural and a lot less expensive! Red isn’t the only LED Light type. Blue lights are used to combat Propionibacterium, which are the bacteria that are found under the surface of the skin and causes acne. When used alongside a series of treatments, the use of LED lights has been proven to be quite effective in improving your skin. It usually takes about six treatments - one every two weeks - plus a series of maintenance sessions once every other month. They don’t take long either. LED treatments can go on for twenty minutes tops and can either be done alone or be made part of a facial or some other treatment. The average cost of LED Light Therapy is about $75 to $125 per session, although it would cost a bit more if coupled with other treatments. Although it’s still new, LED Light Therapy is relatively available in most establishments that offer results-oriented skin care. The service is often just referred to as LED or by their manufacturers like Revitalight or Dermawave. So if the spas have it, they’ll know what you’re talking about. You’re likely to find professional LED treatments at some day spas that focus greatly on skin care. Some estheticians who have their own skin care studios will have this treatment as well. In some cases, they will be available at resort spas. How Do You Go About Getting LED Therapy? Most professionals recommend six treatments of LED Light Therapy, with each one at least two weeks apart from each other. This should then be followed by maintenance sessions that take place at least every one or two months. LED light treatments are indeed painless and can be relaxing to some. In fact, if it’s winter in your area and fear experiencing seasonal affective disorder, you can try getting a treatment during then. The total length of the treatment will vary depending on the actual machine being used, but it never usually goes beyond thirty minutes. Some of these machines have a head that’s about three inches wide. It will be used on a certain area of the skin for a couple of minutes before moving to another area to do the same. But if the head of the machine is bigger, it will cover more parts of your skin, which means the job will be done faster. Unlike laser treatments, LED can’t really hurt your eyes so you don’t need to cover them up. More importantly, LED light therapy is great for those who want to up the collagen activity in their skin or treat mild acne. LED won’t risk burning your skin either, so it’s really a safe choice compared to IPL which functions by giving out short blasts of bright light on your skin, which can cause a bit of discomfort. This doesn’t mean to say that IPL is rendered obsolete by LED light therapy. After all, the mildness of the latter only means that it can’t treat all skin problems. If you have diffused facial redness, brown spots, spider veins, and more, you’re still going to need an IPL treatment. So how are LED and IPL Different? Before knowing the difference, you need to know what the treatments have in common. Both treatments are also referred to as a “photofacial”, which means a facial skin treatment that uses light technology to stimulate the skin. Both LED and IPL are such kinds of technology. - IPL is intended to many different kinds of skin problems, including broken capillaries, brown spots, facial redness, and spider veins. IPL is undoubtedly a lot stronger than LED in terms of intensity which means that it can treat more skin conditions. As mentioned before, LED is only meant for improving skin quality and maybe treating some cases of acne. - Because of its treatment potential, IPL tends to be more expensive than the LED counterpart. - IPL may also take longer as a treatment depending on how bad your skin problem is. Meanwhile, LED treatments are expected to last as long as 30 minutes. Although LED light therapy is a painless treatment, it is nonetheless a kind of skincare which means that you shouldn’t get it without consulting a dermatologist. Even though LED is cheaper, you’ll still be wasting money if you get treated for a condition that LED Light Therapy can’t handle. After all, you might actually need to get an IPL treatment. And whether you take IPL or LED, the treatment might not be enough without getting other skincare treatments to compliment them as well. Thus, make it a point to consult your doctor as to which treatment is best for you. Meanwhile, don’t hesitate to ask your day spa any questions you might have about LED Light Therapy or any of their services. This is to ensure that you’re completely comfortable with the procedure and you enjoy it as much as possible.